Sometimes Your Home Appliances Need A Spring Clean. Ironically, the things that clean your home often need cleaning themselves. When the weather gets changes its tune, and your house gets too dry or too damp, you risk getting dust or mold. Furniture and appliances aren’t exempt from these things that make your home dirty. Not only do you need to keep up with the vacuuming and dusting, but also the cleaning out of appliances. You want the air you breathe to be clean. Let’s take a look at how to clean a humidifier tank with vinegar. also capable of maintaining moisture in the entire home as well. drop to as low as 10 percent in some more waterless, desert-like climates. humidifier and what to clean it with. drains, pour vinegar onto a brush that's small enough to reach down the pipe. side of the drain to get rid of any unwanted odors and built-up dirt. vinegar has boiled, use a damp cloth to wipe it on the walls of the shower. Repeat this process every five minutes for thirty minutes. which you can then wipe on door handles when flu season comes around. It’s more important than you think to clean your humidifier clean. and upkeep to make sure they're working correctly. breaking down on you and not lasting as long as you would have hoped. an excellent carrier for harmful bacteria if you don't clean it out regularly. family will breathe it in. Luckily, the list of equipment you need to clean your humidifier effectively isn't long. It's not an arduous process – in fact, it can be done within a couple of minutes. White vinegar is the best type of vinegar to clean with, so it’s recommended that you get some for this job. You’ll also need a bit of bleach, and some rubber gloves to protect your hands from the bleach. A soft-bristle brush is ideal for this type of job. The filter in your humidifier can be fragile, requiring a soft brush that’s not going to leave any scratches behind. You'll also need plenty of water and towels to clean up afterward. It's recommended that you also use goggles for this task to protect your eyes from any bleach or mildew particles. It's vital that you consult your humidifier's manual before cleaning it. Every humidifier is different and will come with a different set of instructions. If your humidifier contains additional features along with the base and water tank, these can also be cleaned in a similar fashion. Disassemble: first, unplug your humidifier from the wall. Using the manual, work out how to disassemble your tank correctly. This includes removing the water tank and emptying it out. If your model has additional features that unclip, remove these as well and lay them out in order so that they'll be easy to reassemble. the areas that water regularly comes into contact with. You can even place any smaller parts of your humidifier into the tank where you vinegar is to give them a good soak. Leave for thirty minutes. water from the tap and make sure you’ve thoroughly rinsed everything, including the smaller parts. Lay everything out on the towels to dry. once you can feel that all the parts are dry, you can begin to reassemble your humidifier. If your appliances air filter is replaceable, you might want to do so. Now that you've got everything you need to clean your humidifier tank let's take a look at the step by step process. Now that you know how to clean your humidifier tank properly let's take a look at some handy maintenance tips to keep it running smoothly. If you and your family use the humidifier tank on a regular basis, you may want to consider implementing this deep clean once a week. This will give you a good chance of avoiding breathing in air that’s full of bacteria. Before you turn your humidifier on again, it's recommended that you pour any water that's been standing in the tank. While you don't have to disinfect the tank part every day, it's essential to use fresh water regularly. You might want to also think about the type of water you’re using in your humidifier. Because regular tap water has added minerals, these will be included in the air when it’s released. Distilled water is recommended for humidifiers as it doesn’t have these added minerals. When the dry season is over, and you're thinking about storing your humidifier, make sure to give it another deep clean. If any parts of the humidifier are damp when it's stored, there's a high chance of it developing mold. When it comes to cleaning your household, your family’s health comes first. That's why it's important to use natural cleaning products like vinegar when implementing deep cleans. Vinegar is a potent, natural substance that eliminates dirt and bacteria while disinfecting at the same time. Your family’s health is also a reason to clean your humidifier regularly. You’d be surprised at how quickly mold and mildew can build up when water is left to stagnate. If this water is in a damp environment, like a humidifier, the process will accelerate. 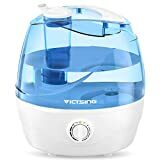 Learn how to clean your humidifier with vinegar and keep the entire family safe from potential health conditions caused by mold and bacteria.